In 1955, Ford’s Motor Company Lincoln division chief stylist, Bill Schmidt designed and built a futuristic concept car called the Lincoln Futura. It was built entirely by hand in Turin, Italy at a cost of $250,000 and was built by Ghia. Like many concept cars, sadly it was never put in to production. Bill Scmidt inspiration came from Inspired a scuba-diving encounter with a shark, Bill Schmidt sketched a low, long, wide, and flat vision of the future with a predatory full width grille, hooded headlights, and shark like tail fins. It only took three months to develop the concept car for its debut at the Chicago Auto Show in January 1955. From there, the futuristic Lincoln was driven to a show in Detroit. On March 3rd, just before the NY Auto Show, with Benson Ford at the wheel and Schmidt in the passenger seat, the Futura cruised from the United Nation’s building through Central Park to the Tavern on the Green restaurant for a much hyped photo session. In the mid 1960’s, George Barris of Barris Kustom City bought the car for $1 directly from Ford. In August 1965, the Batman TV show producers approached George to ask him to build a new Batmobile for their new upcoming show. The only downside was the car had to be ready for filming action in just three weeks. George thought about it and noticed the bat-like qualities that his Futura already had, George instinctively knew it was the perfect answer to the problem 20th Century Fox had created for him. In October of 1965, the new Batmobile was completed and delivered to Fox where it made its television debut on January 12, 1966. The car was such a huge success that George Barris and the producers of Batman show decided to build copies of the Batmobile in fall of 1966. 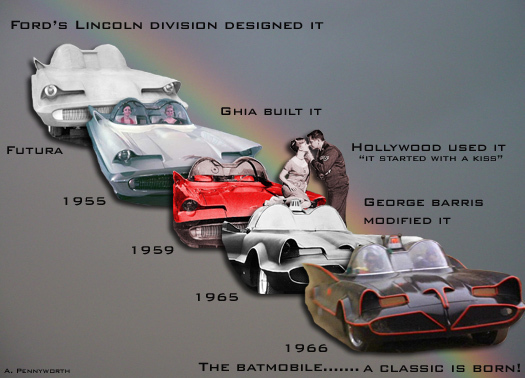 Barris and his crew created a mould from the original (Futura) based Batmobile and created 3 fiberglass copies. These fiberglass replicas were displayed at car shows and dragstrips and also made appearances where the fans could see them. Forty Five years later the 1966 TV Batmobile is still one of the most iconic and popular cars in the world. Exterior paint colour Velvet Bat-Fuzz Black from Metalflake, Inc. The pictures I have taken here I have no doubt is one of the 3 fiberglass copies made at the time of the show. This one comes from the London Motor Museum. The interior seems a little different too, but the bodywork is the same. Ooh, shiny! I saw this at one of the Comic Cons, very impressive. It was impressive that’s for sure. It was bigger than i thought it would be. Yep. Batman was taller than I thought he’d be too!